Underwater interaction with whale sharks homing at the coastal waters here now has an added treat for thousands of visiting scuba divers: a side trip for exciting dives at the nearby Manta Ray Bowl of Ticao Pass. 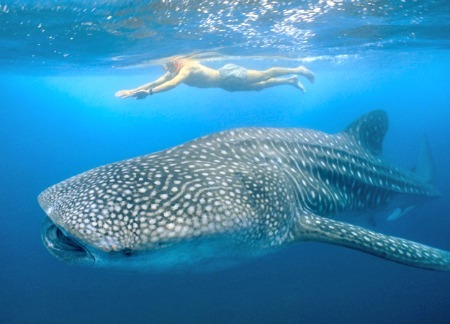 From December to May each year, whale sharks--locally called butanding--gather to feed on the rich, plankton-filled waters of this town known as the Whale Shark Capital of the World. During this season, the whale sharks arrive in vast numbers to take advantage of the dense food concentration near the mouth of Donsol River, which has become as seasonal feeding ground for these enormous sea creatures--giving scientists and conservationists the opportunity to research on these endangered species. On average during the season, 22 whale sharks are spotted daily, Maria “Nini” Ravanilla, Department of Tourism (DOT) regional director, said Thursday. These creatures have been frequenting the waters off here for generations and in 1998, the DOT declared the area an official sanctuary for the whale shark, thus protecting this fascinating species. These gentle giants arrive from as early as November but the official season starts from February and runs until the end of May, when the local water is at its clearest and calmest. Local tourism officials and professional divers have established guidelines on proper whale shark watching, intended to maintain safety and to defend the creatures from over exploitation. The municipality receives an average of 60,000 local and foreign tourists for this sea spectacular yearly, DOT records show. “After successful interactions with the butanding, we can see now boatloads of tourists, mostly divers, leaving our shores for the Manta Bowl of Ticao Pass,” Ravanilla said. Located in the center of the Philippines, Ticao Pass is one of the best kept secrets in Bicol where the amazing “winged giants”—manta rays--thrive en masse. Bounded by beautiful beaches bordering Ticao Island, Ticao Pass is home to a number of dive sites collectively called “The Manta Bowl,” owing to plentiful sightings of the winged giants that could be worth the trouble to dive the relatively difficult waters with its strong currents, to find these awe-inspiring creatures with “wings” that can span up to 10 meters from tip to tip. Ticao Pass, which separates Sorsogon and Ticao Island, has one of the world’s highest concentration of plankton owing to the strong currents from San Bernardino Strait.